I love getting new cookbooks – it’s so fun to flip through ’em + decide what recipe to make first. My newest cookbook arrival was especially exciting: the gorgeous Breakfast For Dinner, written by food blogger husband-and-wife-team Lindsay Landis + Taylor Hackbarth, who I know personally through the Nashville food blogging network. I’ve been lucky to sample lots of their baked goods + sweets in the past, so I was so excited to read through their cookbook + try out their recipes myself! After flipping through all the beautifully-photographed recipes, I settled on a decadent, over-the-top sweet: Chocolate Brownie Waffles. While I normally prefer savory dishes, my sweet tooth has been out in full force lately, so I decided to treat it to something special. So, how did the waffles turn out? Amazing! They’re rich, fluffy, + full of awesomely chocolatey flavor. The recipe originally called for them to be served with a sweetened blackberry sauce, but I wanted the chocolate to be the star of the dish, so I accompanied them simply with whipped cream + fresh strawberries. And it was perfect – I gobbled these up as an afternoon treat, + then, I confess, I made them again the next day for lunch! For the full recipe, hope over to Cooks + Books + Recipes, where I’m guest posting today! Ooh, it would be SO good with some ice cream – like a brownie sundae meets waffles. SWOON! Lindsay and Taylor did such a great job with the book, it’s become a firm favourite. As soon as I saw this recipe, I knew I’d have to go and buy a waffle iron so I could make it! Kathryn, I don’t own a waffle iron either, so I asked a generous neighbor/friend to lend us hers because I *had* to try this recipe! =) not only am I totally in love with this recipe, now I know I need a waffle iron of my own! so good. SO FREAKING DELICIOUSLY GOOD looking. I made the mistake of reading this post before I ate breakfast. my paleo muffin is looking rather sad, now. Looks awesome!!! And yes, I am semi jealous! can’t wait to try this! yum!! 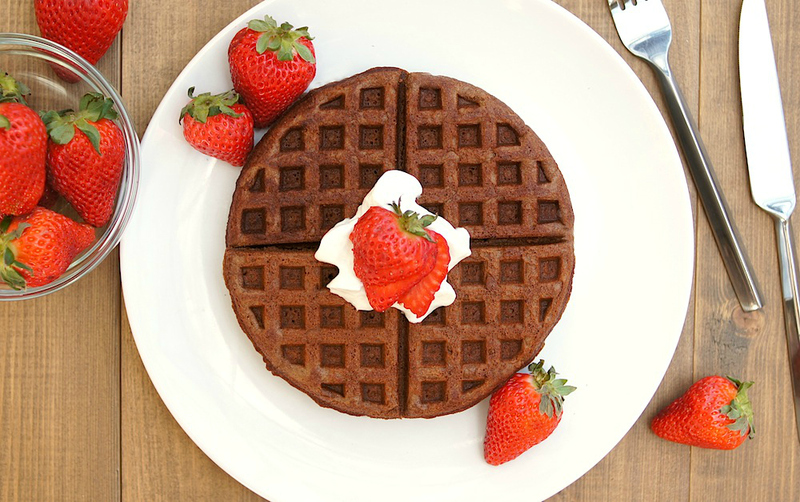 Chocolate brownie waffles sound amazing, I really want a waffle iron! How are you doing? I hope you are well. From the tone of this post, you sound wonderful. These waffles sound fantastic, and they look so tempting. Great job on the pix! I love breakfast. I think it really is my favorite meal. I am going to have to get the book. Sold! I’d love these with berries and cream too. They look so beautiful! Ha! Amy, you SO should have made these in the waffle boat waffle iron! These, filled with a scoop of really good vanilla ice cream? OMG! I know, right?! That’s part of the reason I’m still hanging on to the waffle boat iron – i want to give it a try before I give it back, ha! =) Thank you again SO much for lending me the waffle irons. I promise I’ll deliver ’em back to you soon! I would love this cookbook. I love sweet things for breakfast like this, yum!! I have been wanting to get my hands on Breakfast for Dinner since it came out. These brownie waffles need a scoop of salted caramel ice cream in the middle! I would gobble these up no problem for breakfast, lunch and dinner! This looks like my kind of waffle! Except mine would have HEAPS of whipped cream and strawberries, heh! Wonderful recipe, Amy. I’m with Tracey, I’d love one of these with a scoop of ice cream! So good! Ooooo…..I definitely need to check out that cookbook-love breakfast for dinner! I’m wishing I had one of these yummy waffles right about now Heading over to check out the recipe so I can whip up a gluten-free version! Hope you’re having a wonderful weekend Amy! Oooh! These look amazing! Great breakfast and lunch and Dinner!!! These look delicious, I’ve been debating on buying a waffle maker but I’m running out of place to store appliances! I hear ya! We’ve run out of room for appliances, too, so I don’t have a waffle maker – I just borrowed a friend’s for this. =) Now I want one, though! That’s one of my favourite blogs to follow! Their cookbook is definitely on my wishlist, jealous you have it! Hope you and your baby are doing well! These sound amazing. I must admit that this cookbook has been tempting me for weeks. I might just buy it after seeing this! What! These look amazing. I’ll take any excuse to eat a brownie for breakfast. These are just gorgeous! I could eat these for dessert…but breakfast sounds ideal too! Thank you for sharing. There is nothing better than browsing through cookbooks and finding a winning recipe! 1: you have great neighbors!! 2: this is mouthwatering, and waffles are my greatest weakness! Brownies and waffles? Together at last?? Ridiculous and I love it! Brownie waffles?! Ugh. I want a waffle iron. I didn’t even know that chocolate waffles were a thing! 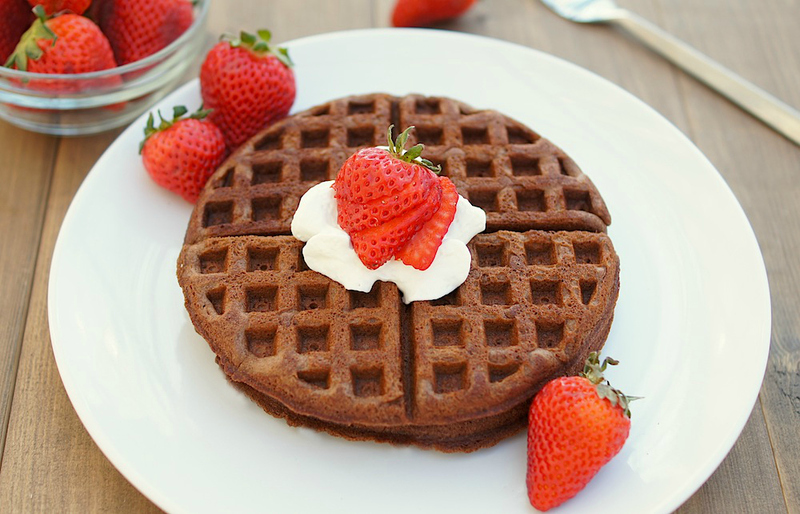 Or brownie waffles. Aww, man. This stinks! I don’t think I need to say this but they look amazing.